Motion RC is proud to unveil an upcoming member of Freewing’'s jet family, the 80mm Avanti S. The world’'s only officially licensed foam electric Avanti, courtesy of SebArt and its titular designer, Sebastian Silvestri, the Freewing 80mm Avanti S is poised to thrill EDF pilots the world over with its sport jet styling and powerhouse performance. 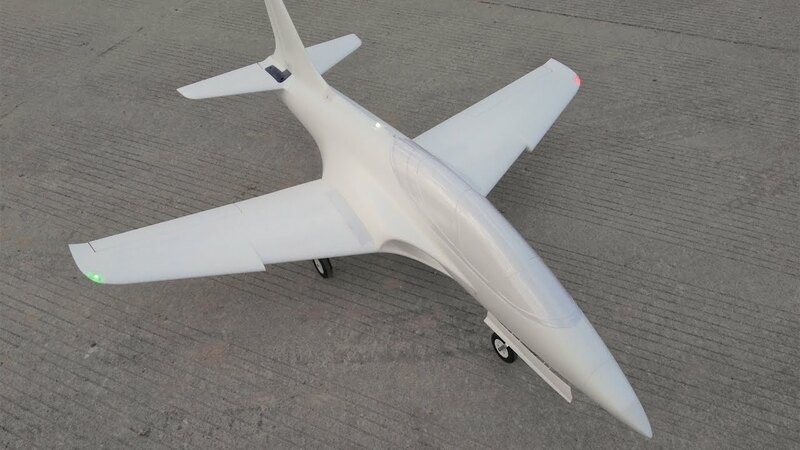 Sebart’'s popular Avanti S design has distinguished itself for years in the RC Turbine format, with the largest fiberglass/wood Avanti XXL topping out at a 2.5M wingspan and 40 pounds dry! The Avanti S in a variety of sizes and powerplants has won awards in freestyle, acrobatic, sport, and other classes in competitions worldwide. Its remarkable performance and crisp handling at all speeds sets it apart as one of the most sought after sport jets in the hobby. We’'re excited to bring this elite pedigree of design and performance to the foam electric class with the Freewing 80mm Avanti S. Here are a few quick specs on this aircraft, available worldwide in Spring 2017. Two seat foam cockpit, with detached clear plastic canopy. Pilots can paint or tint the canopy, or detail the cockpit as they desire, before gluing the plastic canopy on. We'll publish more information as we're able. The model pictured is an EPO molded production sample, not a CNC prototype. Thanks to Pilot Evelyn for this photo! Wow! I am more of a military bird lover but I really like the looks of that sport jet. I'm pumped about this! I love sport jets and was really hoping for another by Freewing, so this is great news and I can't wait to throw this one around the skies. Great call guys! I'm excited for it, too. I'll be back in California with one of these in mid-January for test drives, and we'll have Ryan and Mike give this bird their usual red carpet treatment. We've finished everything on the model and the molds are complete so it's just a matter of production time. We have lots of Tigercats in line to produce, among other things. It's going to be a fun 2017 just as it was an expansive 2016. Excellent news! You've all been busy bees, so thanks for the continued efforts for all of us in the hobby to have some fun. That's what this hobby is all about, so it's a blast to see people come together, enjoy their time flying and talking about RC, sharing a wealth of knowledge, meet new friends, etc. It's definitely going to be a great 2017. Ha-ha-ha, I'm in love already with this jet. That looks like a lot of fun. You're right, it really is a lot of fun! Gosh, YouTube really crunched down the resolution on that teaser video... it's mostly sounds of a dot streaking through the sky, but at least this gives us a bit of an idea of this bird's handling --It is definitely no slouch. The sound at 1:40 and at other points when the aircraft is accelerating, is very satisfying. I cut in different parts of the flights to show the aircraft's top speed, slow passes, gliding, vertical authority, loops, stability throughout tight maneuvers at high speed, slow landing without any headwind, knife-edge, rolls, etc. It isn't just about straight line speed. Like the Stinger 90, we really wanted to ensure the Avanti can excel at a wide performance envelope, and do things that with certain scale jets are very difficult to do. This bullet accomplished our goals and more. The tall loops are especially fun. That why I love well-designed sport jets....it's simply for the love of flying, and all the versatility it offers. Scale jets I love too, but it's a completely different satisfaction I achieve by flying them, and that primarily comes from the scale look of them as they fly by. When a person wants to have bundles of fun though and the utmost in aircraft predictability, yet with versatility, the sport jet is where it's at. Personally, I think you guys knocked it out of the park by doing this jet justice, and the sales will follow especially at the price point it's sounds like it will come in at. Whoa! Fantastic news Alpha! Looks to be a super sweet flier! Hopefully these will be available in time for the Jet Jam next June. EDF Jet Jam, here one comes! Looks like a ton of fun - can't wait to see one in person! Just great....now I have to justify at least two new EDFs in the spring.... you're kill'in me Motion..
Wow... That's BIG for an 80mm. F-86 style! I like it! The final painted PNP model is projected to be ~2030-2050g empty. 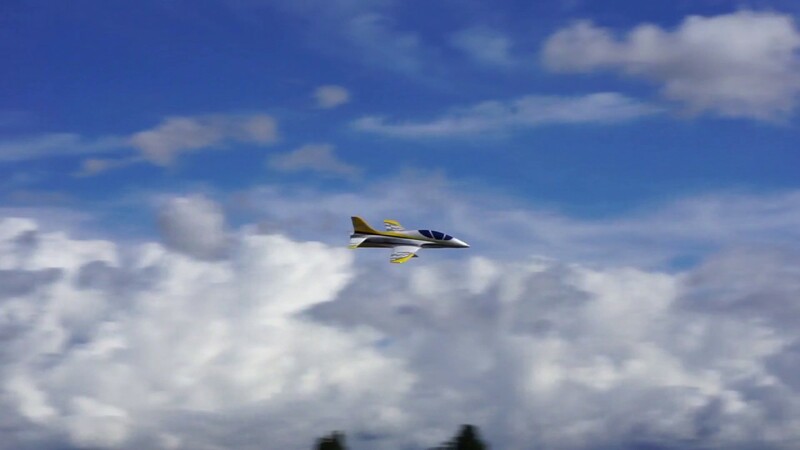 Lighter wing loading on a sport jet is important, and the difference shows in the video! This looks like a really nice sport jet. I like the color scheme in the pictures above. I wonder if it's as quick as it looks in the video, it would be nice it is was.